Life of Miss Sunshade - The Vancouver SuperDALE: Where is the BAD MOUSIE?? Yesterday, mom took me to the University of British Columbia Thunderbird Stadium for a walk. I ran around the field, AND THEN.....a familiar scent caught the attention of my nose. I started air scenting and moved toward my target. Finally, I came to a stop at the huge rolls of fake grass piled as high as a little mountain beside the stadium. I let my instinct kick in and started to go up and down, up and down the mount of rolls to try and locate the source. All of a sudden, VOILA...I found the source!! However, after a long and hard try, I got really REALLY frustrated. I was so mad that my head, my body, and I were just way to0 big for the tiny spaces in-between the huge rolls. Those yummy mice were hiding in there!! I could "hear" them mocking me (yes, I understand "mice" as it is part of the terrier heritage), I could smell them, but I wasn't even close to catching one due to my HUGE size (gee...I'm already eating the Atkins Diet). At that moment, I really wished I was born a mini Rat Terrier!!!! Oh Sunshade- that IS frustrating. I understand because my dad built a tree bench around our huge pecan tree and now I can't get to the darn squirrels. Urgh. I have killed one though. Wish I were there for you, maybe I could have fit in that hole and flushed him out for you. Its all about the nose! 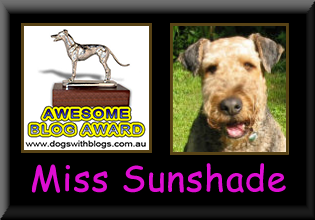 Sunshade- I put you on my blog- I hope you don't mind. I wanted my freinds to see my pretty new girlfriend!!! You are very beautiful. 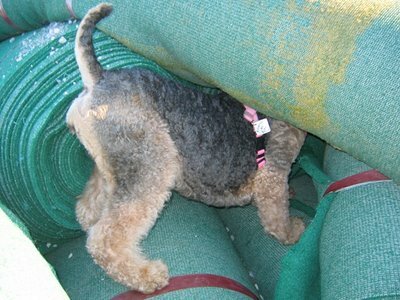 Of course I think ALL Airedales are beautiful. We have an Airedale that was the love of our lives, named Shama. But after she died we couldn't bring ourselves to get another dog. however as artists we paint Airedales ( mostly me Barbara). Ask your mom if she might allow me to use some of your photos ( or e-maqil me some different ones maybe) to use as inspiration for Airedale paintings. Actually I sell my paintings mostly on e-bay, but have been in a down uninspired mooed lately. Your photos perked me up. If your mommy says no I understand. We found your blog through our wirey pal Mackie. We're Butchy & Snickers, wild & wooley wire fox terriers from Iowa, US. Our Mom thinks you're a beauty!! Love your blog colors, sames as our, hehehe! We enjoy your blog stories. Visit ours sometime when you have a chance. I think the University people should hire you to put the grass back down - I can see from the video you would be great at unrolling it! Then you could BUY mice to play with, you won't have to search for them. Good idea, eh?